Last April we moved into our new place. It’s bigger than our last apartment, with lots of windows that fill our place with so much light that I sometimes have to pinch myself. Our kitchen is still small – just a plain apartment-style galley kitchen with 2 countertops that aren’t terribly useful and certainly not envy-inducing, but they do the trick. I don’t have a window above the sink (oh to dream) but I’ve got a dishwasher so I have no real right to complain. The kitchen isn’t my style but it’s new, and when we’ve got enough savings, we’ll tackle the job to put in the kind of cabinets and counters that will make the kitchen brighter and a happier place. 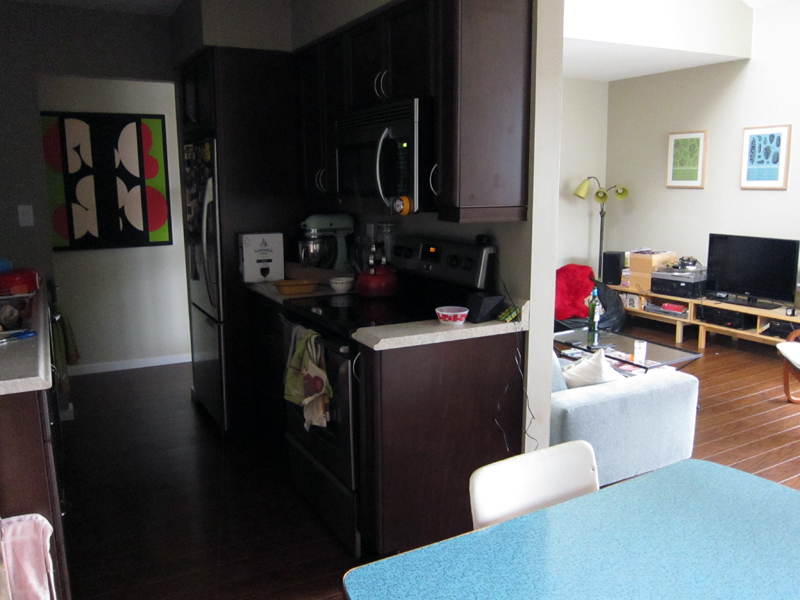 And we still have artwork to put up on the walls, but I love our place with it’s open spaces and cheerful light. Here’s a couple photos taken on the greyest & dreariest morning so you can see a little of what I see everyday. Yes, I told you it was small. Maybe you can see why my kitchen isn’t the greatest for “action” shots. But look, I found a cute little bookcase for $30 at a local vintage shop and it now stores all my cookbooks in easy reach of the kitchen. I love it. Oh hey, this blog turned 8 years old today. Sorry I picked out such a long and confusing blog name, but I’m glad that so many of you have found your way here to cook, comment and pass along my site to your friends and family. I’m super thankful. To return the thanks, I’d like to share some of my favorite food blogs. Sure, you can just run down to my blogroll, but I’d like to give some shout-outs to just a handful out of the many blogs who’ve inspired my cooking and made my kitchen a better place to be in. First off, there is the fantastic Tim of Lottie & Doof. If I have a favorite blog, I think it’s this one. His site is a well curated list of photos and recipes that dare you to dig further and try something new. Case in point, these cheerful Sugar Saucers. 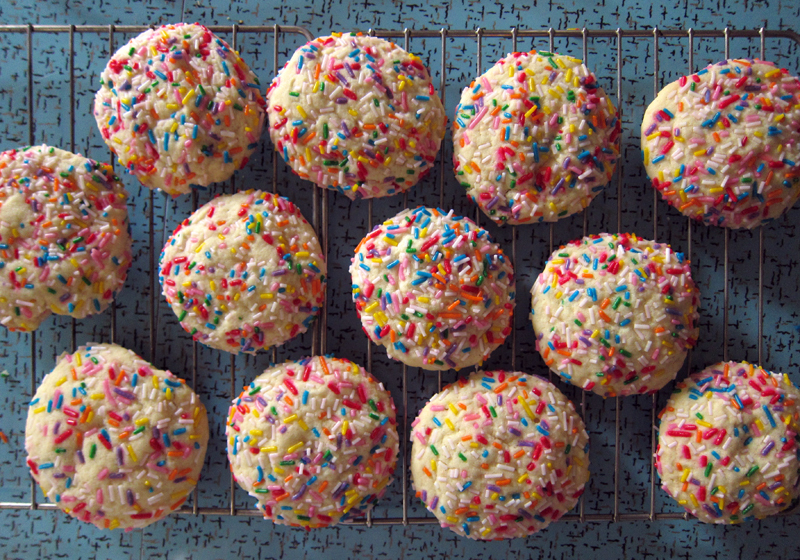 How can you resist colourful candied sprinkles? I thought I could, but apparently not. I made these recently to give as a gift and instead I wanted to keep them all for myself. Luckily, I have self-restraint and gifted half the batch. The other half, I ate happily and wrote about it at Poppytalk. Next up is Tara at Tea & Cookies. I’ve met her in person and she’s lovely. She also makes one helluva mean garlic soup. I’ve made this soup countless times and every bowl disappears before I have a chance to take a photo. It’s that good. Creamy, buttery, and mellow and warm with garlic. Don’t skip the parsley nor the fresh-made croutons (don’t skimp on store-bought when chopping cubes of bread & toasting them in the oven is so easy). My husband,a well-documented soup hater, loves this soup. So there you go. Orangette is another blogger who I adore. Have you seen June? Totally adorable. Two words: oat cakes. I haven’t yet made these, but this weekend I’ll whip up a batch. I know they’ll be great because some of my greatest hits have come from Molly’s Seattle kitchen. There’s another Tara, well east of here who you probably already know over at Seven Spoons. Her photos and words are beautiful without being too precious. Years ago she sent me an extra cupcake cookbook that was sent to her so she’s got a giving soul too. I can’t wait to give this fruity breakfast cobbler a try. Yup, you heard right: breakfast cobbler. Kimberley at The Year in Food‘s photos inspire me to take better pictures. I struggle with that one. Would I be a bad food blogger to say I’m not interested in learning how to use a fiddley camera when I love my little Canon point and shoot. But I’d love to learn to compose my photos without looking fussy instead of just a quick snap or two before I sit down to dinner. I love a good chai and this one seems spicy and warming. Perfect for today’s grey day. And since it’s a blog birthday, there should be cake. I think this spice cake with browned butter frosting from Dinner with Julie would be a fitting tribute. That Julie makes it a money cake? Well, even better. Remember those? My mom never made me a money cake – probably because she feared I’d choke on a quarter – but whenever I was at a birthday party with a money cake, well, that was THE BEST. And because you come for the recipes, here’s one to share that I found over at Dula Notes (who I met back in June & is just lovely in person). This isn’t your grandmother’s feta. It’s whipped until light and fluffy that it almost doesn’t resemble the original cheese. Lemony and garlicky along with the salty tang, this makes an ideal dip with crunchy red peppers, cucumbers and slices of lightly toasted baguette or pita. Serve alongside glasses wine to a good group of friends and you’ve got a party worth remembering. My husband had no idea what was involved and thought there was yogurt in there. That sparked an idea to try next time to cut down on all that olive oil. elsewhere: Head to Poppytalk where you can continue the party with a Greek-style baked shrimp dish. It’s easy and a fabulous meal to whip up for a dinner party. I think yogurt would be a nice addition here. Cut half of the olive oil and sub in some plain yogurt. If you try it, let me know how it goes. Add the garlic to a food processor and pulse it until it breaks down to tiny bits. Crumble in the feta, lemon zest and juice plus the thyme and give the processor a whirl, slowly adding in the olive oil until you get a creamy consistency. Sprinkle with bits of thyme and serve with fresh vegetables, pita and bread. Congrats on 8 years AND the new place – so exciting. And I love small kitchens. They’re so much more efficient than those giant dream kitchens I see all over Pinterest. Thanks for also listing your favourite blogs. I visit some of them on a regular basis. Ok, I think you must be tapping into your inner Greek. You’ve made what is called “tirokafteri” (translation: spicy cheese) The only difference being that hot minced peppers are added into the feta cheese dip as well. Congrats on 8 years! 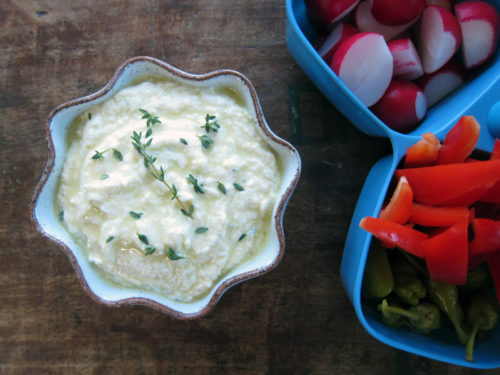 That feta dip looks delicious. Happy 8 years!! Wow that is quite a feat!! It’s interesting, we follow so many of the same blogs, so it’s no surprise to me that I’ve been a reader of yours for this long! Congratulations on your 8 year anniversary! I love your blog, and your thoughtful way of writing. 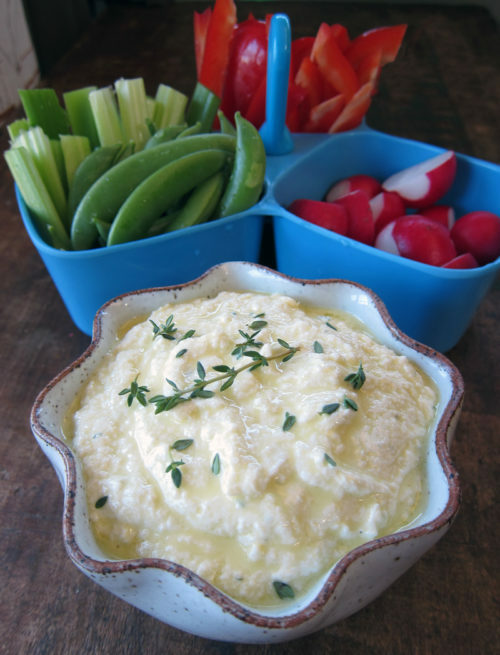 I also love feta, and dip and this looks perfect. 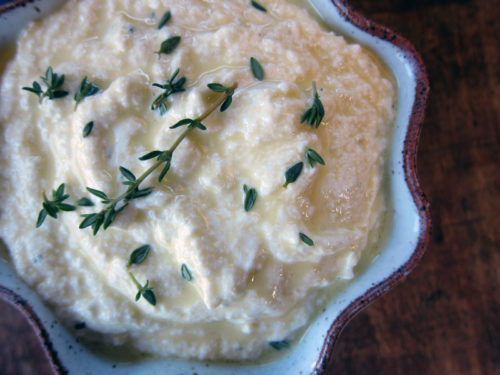 I used to buy a feta dip at a local grocery store that was made with mint, and I think, something else to thin it out, probably yogurt, but maybe sour cream. Used to go swimming every Sunday morning with a friend, then come back and devour the dip. Good memories. oh, and your place looks nice! very welcoming and cute. Congrats on 8 years!! I love your new place and all of that beautiful natural light. I’m glad the dip was a hit at your party and I like the idea of yogurt in there! Bookmarking the garlic soup and oatcake recipes for later 🙂 So glad we had a chance to meet and I always enjoy visiting your blog. Congrats on 8 years. I love your blog and your recipes. Thanks for sharing your favorites too. I always love finding more fantastic people to read. I can’t wait to check out some of these blogs – they all sound lovely. If only there was more time in the day to devote to checking out all of the wonderful spaces here on the Internet! And congratulations on your 8-year anniversary – may there be many more! PS. Whipped feta? Yes please! Congratulations on 8 years! That is a truly phenomenal effort. Here’s to another 8! I thought it was time to comment–I love your recipes and sunny writing style, and know what? I like your kitchen too. 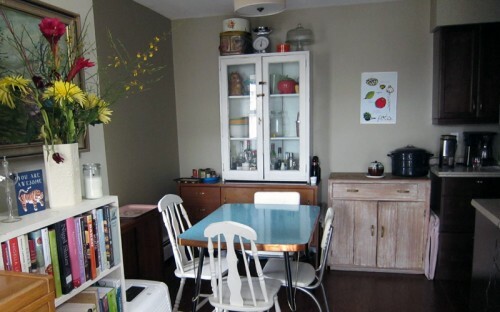 It’s fun to “work it with what-cha got” and see how creative you can get in small spaces. This is a great looking dip. I love, love feta cheese, so this is a winner (I know already, without even tasting it!). Thanks everyone for your kind comments, especially those who have popped out of the woodwork to say hi! !